Installed sometime around 2003. Latest update 19 Oct 2013. Text changes or additions are in bold. 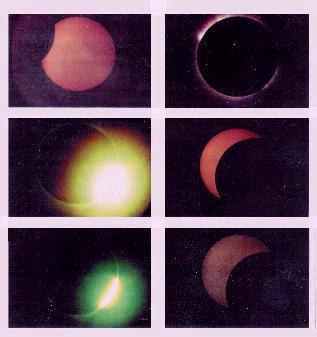 The photographs to the right were made in Mexico on July 11, 1991 by John Guyton, a science educator at Murray State University in KY, using a Dobsonian telescope that I used to own. It turns out that the scope had a longer focal length than either of us suspected at the time of the sale. That longer focal length was a factor in the decision process of which telescopes lug off to Mexico. Be as it may, I feel as though I had an ambassador in Mexico (the telescope) during the eclipse. Months later, when John was back in town, we bumped into one another while he was running copies of this photographic montage. Five dollars got me one, and that eventually led to this web page. By the time I put the web page together I had forgotten (could not recall) John's name. I put a note on the page, saying that if the photographer ever happened to see the page, to please contact me. 06 Jul 2005 - John (now Dr.) Guyton, of Ocean Springs, MS, visited the page today and filled in the fuzzy spot in my memory. 19 Oct 2013 - Dr Guyton is an Associate Extension Professor (Entomology) in the Biochemestry, Molecular Biology, Entomology & Plant Pathology Department at Mississippi State University.